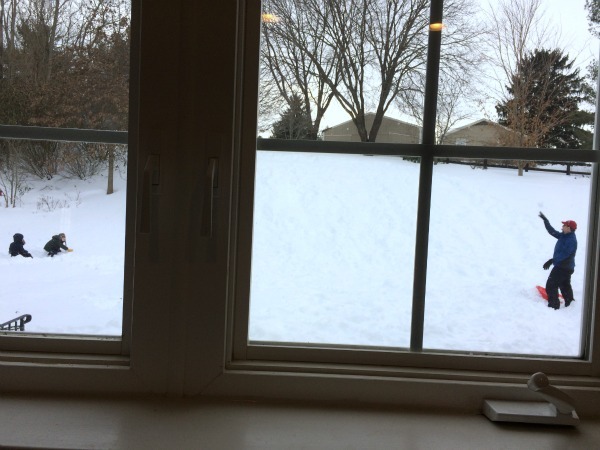 It’s been 3 days since our epic Virginia blizzard and I’m staring out my kitchen window at my husband hurling snowballs at our two oldest boys. 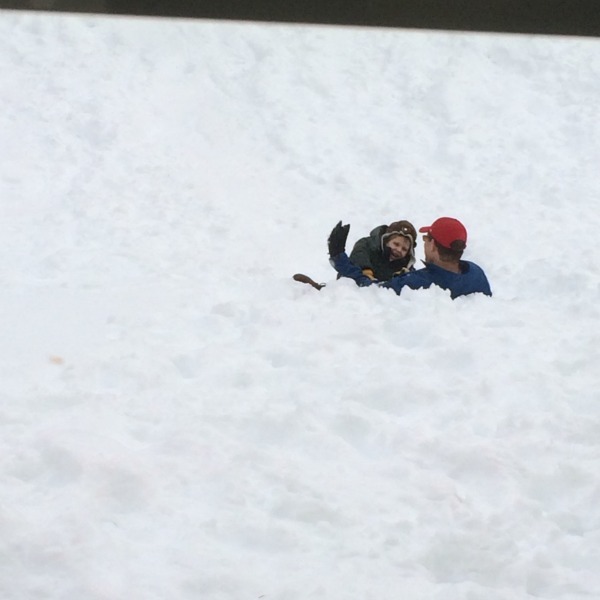 He’s pressed pause on his work on this particular Tuesday afternoon to make memories with our 4 and 5 year old boys and what for us is an unreal 3 feet of snow. I’m dawdling over the dirty dishes so I can watch them, finding myself falling in love with this good man all over again. My oldest son has carved a trench in the snow and he’s been saving up ammunition for dad’s appearing. There’s a big smile on my husband’s face as he ducks and dodges the barrage–friendly fire. 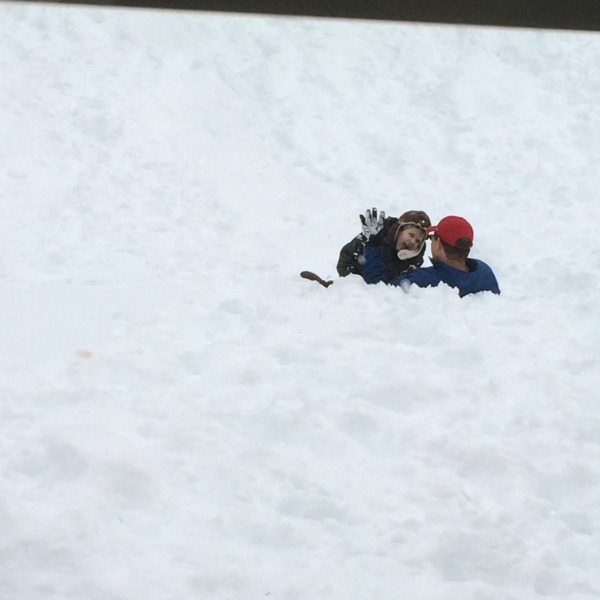 In a few minutes, my husband makes his way to the top of our steeply sloped backyard with the four year old, sleds in hand. I add some more soap to the suds and watch the silent movie unfold. 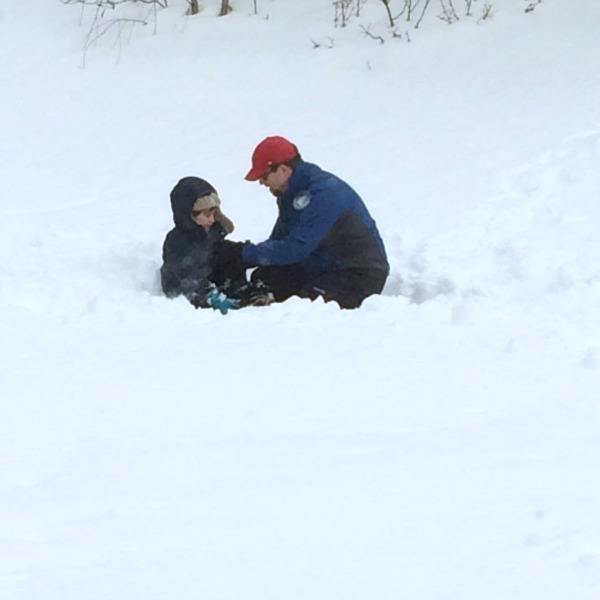 When you add little ones to snow, you have a wintry mix calling for abundant patience. 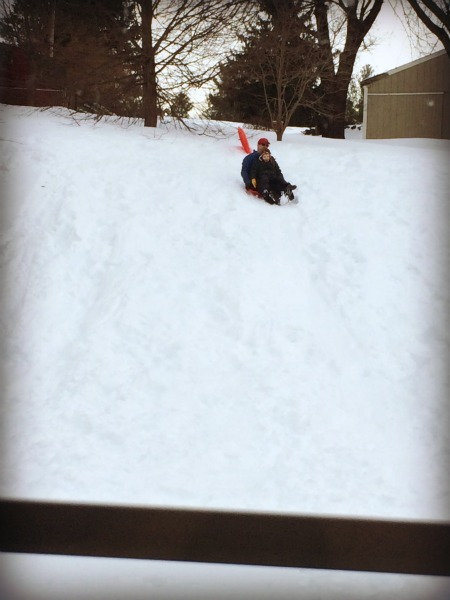 A child plodding through 3 feet of powdery snow on an upward slope plods slowly—pain…fully slowly—along. Once atop the hill there’s the displaced mitten that needs replacing, there’s the hat that needs to be pulled down again, and there’s the sled that needs to be held in place while the abominable snowsuit clumsily piles on. I watch this man I married patiently, gently waiting: letting the little one struggle with the things that make him stronger and helping with the things that simply exasperate. It’s a good father who knows the difference. Finally the minutes of patience pay off with seconds of glee. Open-mouthed, hollering glee. And then they repeat: plod, patience, push, glee. On the third go round, they decide to share a sled. It’s cute: full grown man and little man sharing a two foot disc of plastic careening down a hill, twisting, turning, heads thrown back in laughter. This is the good stuff– the moments kids remember when they shut their tired lids at night. And perhaps just perhaps it’s that earliest memory that somehow makes it into adulthood, the one that grounds you with a deep mooring of being loved and held, and of being caught up in joy and adventure and wildness, of simultaneously being daring and of being protected by someone bigger than yourself. I smile: I get to watch it. I love having a front-row seat to this man who won my heart growing into the kind of father who is winning the hearts of his boys. 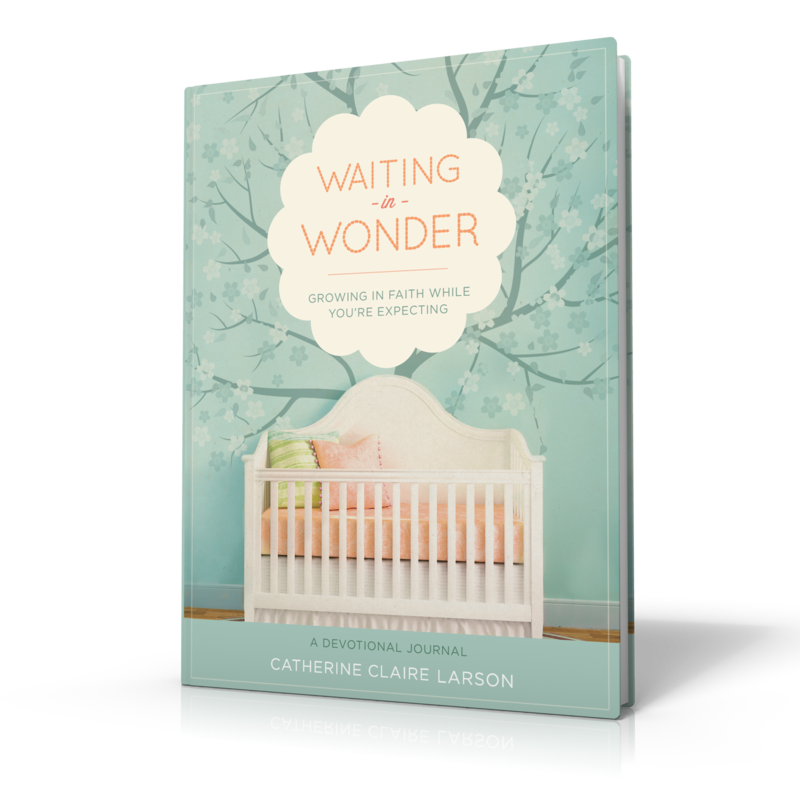 When we set out on this journey of marriage we both only had vague notions of what the other would be like as mother or as father. That kind of love sees the bud, but it is breathtaking to see the blossom, and I pray and hope that one day will be even more satisfying to taste the fruit of years of faithfulness. My husband wouldn’t like this analogy, I think as I chop the onions for the chili. He’d need something heartier, meatier, more manly. Prospect versus World Series winner: there we go, I think. I’m glad I was a decent scout. But the truth of the matter is when you set out to build a house, you think about paint colors and floor plans, tile and carpet, but when you set out to build a home, you think about the people that are the weight-bearing beams. Houses are built of timber and brick and concrete; homes are built of heart and vision and faithfulness—and a man who has these in abundance is hard to find. I’m draining the grease off the ground beef when I see my husband dart over to the trench my five year old is continuing to secure. The little one’s face is contorted in pain, tears stream down his face while daddy bends down to comfort him. That tenderness, that love–there it is again. In a few minutes, the tearful clouds have passed and they return to their play. By this time the baby has stirred and so I stop my dinner prep to tend to him and then to the toddler who’s awakened from his nap. A while later Dad heads back to his home office for a bit more work before dinner. He must pay the toll before passing, however, and I thank him for being such a good daddy as he places a snow-cold hand on my back and gives me a kiss. He doesn’t know I’ve been spying on him from the window, thanking my sweet Jesus for gracing me with this man. Soon boys stomp snow covered boots on the back steps. And then there’s a flurry of wet socks, snow pants, jackets and mittens piled into the laundry basket and a mess of half-clad boys clamoring for hot cocoa. I tend to them and then to dinner. After dinner, I find myself back at the kitchen window, washing up the chili bowls and thinking again about the view I have on the man I love. There aren’t many people in this world that we get to view up close. I’m thankful that the man I get to see each day is the one who faithfully shovels the snow out of the driveway, who works hard providing and bears the heavy burden of planning for our future, who plays well and laughs often, who hugs and wrestles our boys and loves me with the kind of love God knew would make me flourish. I’m glad that whether or not I’m there watching, he’s being faithful, not perfect but faithful to love us well. And as I’m looking out that back window, for a moment, I get the feeling that perhaps God is watching me from the other side of this same window. I sense that he sees the dishes washed, the onions chopped, the boys fed, dressed and re-dressed, the baby held, the tantrum soothed, in other words, the quiet ways I’m trying to be faithful too. I sense that perhaps he’s smiling at me, the other weight-bearing beam in this home being built on love. I’m thankful that God is the foundation of this home. The solid rock which still stands even when we falter and fail, because we don’t always love well or parent patiently. And I’m also grateful that even though my husband’s not perfect, that God gave me the perfect man for me. 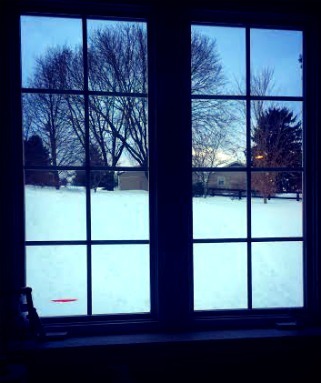 I pray when he reads these words he’ll catch a glimpse of the view I see through my window. If you’re reading this, chances are there is someone whose faithfulness comes to mind for you too. Perhaps you’ve seen the faithfulness of your spouse, or your own mother or father, or a daughter or son as they grow into a loving parent. If so, would you share this with that person and thank them. Tell them what you see through the special window God has given you and thank them for the way you’ve been blessed because of it. Beautiful words, Catherine. There is something about watching you big and little boys together that does a heart good. I think that’s been the best part of the snow.